Perhaps the most famous of all of 007's means of transport is the Aston Martin DB5: the first car to be adapted by Q-Branch for field work and fitted out with a wondrous array of gadgets. James Bond's personal vehicle, the old Bentley, is replaced with the higher-specced Aston Martin DB5 on the "Goldfinger" mission. 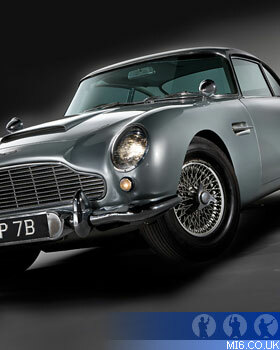 The car was in the design stage in 1963 when the filmmakers approached Aston Martin. The crew was loaned the original prototype as well as purchasing one for Q to fit out with hidden weapons and tricks. The DB5 was an advancement on its predecessor, the DB4, with a larger capacity engine, a slightly larger body and a bulkier and more "male" design. 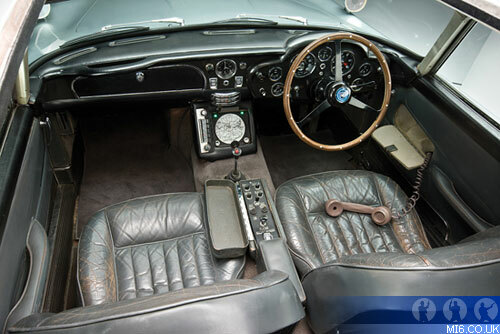 The original DB5 was one of the earliest cars to be sold with an optional automatic gear box - however this was not the option 007 and true motoring enthusiasts selected. The car (before Q-Branch got its hands on it) was worth �4,175 in 1963 - an astronomical sum in terms of earning and purchasing power for the day. Ian Fleming had originally put 007 in an Aston Martin DB Mark III when he wrote the novel back in 1959, but four years later when shooting started, newer models had been produced and the latest and greatest was required for the world's favourite secret agent. The DB5, made famous by 007, boomed into a massive merchandise icon. Today, fans can buy diecasts and miniatures, Scaletrix sets, and many other collectibles. Goldfinger - The Quartermaster of MI6 (who 007 by this time had nicknamed Q in honor of his section, Q-Branch) introduces Bond to the DB5 in his lab at the Secret Service headquarters at Regent's Park. James Bond is suitably impressed with the gadget-laden vehicle and exclaims "you're joking" when Q shows him little red button that operates the ejector seat. The DB5 becomes Bond's wheels for the rest of the Goldfinger mission, taking the zippy Aston to Stoke Poges where he golf's with Goldfinger before having his precious cargo loaded on a jet bound for Austria. 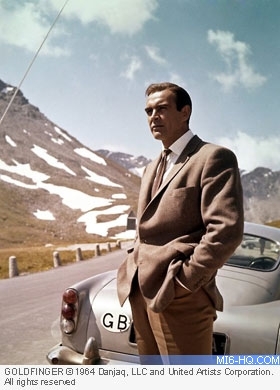 Roaring along an alpine road, Bond is overtaken by an agitated female driver. 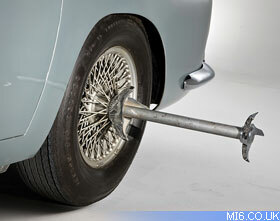 Determined to find out what her game is and why she too is on the tail of Goldfinger, Bond deploys the vicious tyre-slashers that extend from the hubcaps of the DB5. Driving Tilly Masterson off the road, Bond offers her a lift in order to investigate. The Aston comes to life in a high-speed getaway with Tilly onboard. Bond made use of the oil slick and smoke screen facilities to run the pursuing cars off the road, the retractable shield is deployed in the same high-speed chase to block off the enemies gun fire, returning the rain of metal with his own automatics hidden behind the fog lights. Despite hsi best effort, Bond is captured and allowed to drive the DB5 - this time escorted by an armed guard in the passenger seat. In one last effort to make good his escape, Bond deploys the passenger-side ejector seat. In this final fray the DB5 was written off as Bond plays late-night "chicken" with the driver of a pursuing car - who turns out to be his own headlights reflected in a mirror. 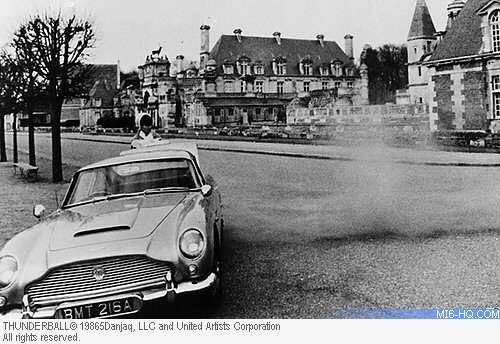 Thunderball - Bond takes a second DB5 to France, where he is tidying up some loose ends. Having assassinated the rogue Colonel Jacques Boitier, Bond makes good his escape via jetpack to the waiting Aston. As the Colonel's goons catch up with him, 007 deploys the bullet-proof shield and utilises a new gizmo - a high-powered water jet emitting from the tail. Later, Bond is leaving his retreat in the sunny English countryside when he is tailed by the suspicious Count Lippe. In the Aston, 007 prepares himself to deploy a trick or two but circumstances change when an assassin on a speeding motorcycle deals with Lippe for Bond. Goldeneye - Bond takes the classic Aston Martin to Monaco where he is enduring a psych evaluation. Bond is distracted however when an attractive femme fatal in a red Ferrari challenges Bond to a downhill race, which he accepts with gusto, much to the terror of his evaluator Caroline. When she could stand it no longer, Caroline ordered Bond to "stop this car at once! ", to which Bond slammed on the handbrake, and popped the glove compartment to serve Caroline a glass of Bollinger. Later in the mission, Bond spies on Xenia Onatopp as she boards a yacht - The Manticore. 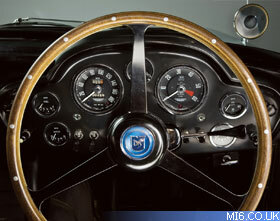 With the pictures saved to his digital camera, Bond returns to the vehicle and wirelessly transmits them to MI6 HQ. The ever efficient Moneypenny is on the line to tease Bond and to analyse the pictures. Tomorrow Never Dies - Bond speeds from Oxford to London in the classic DB5, now used as his personal UK transport - not as an MI6 asset. 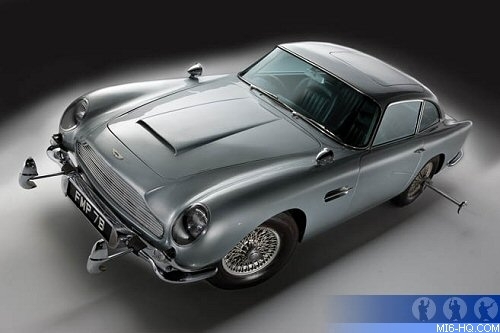 The World Is Not Enough - The Aston Martin was driven by 007 to Sir Robert King's funeral in Scotland. 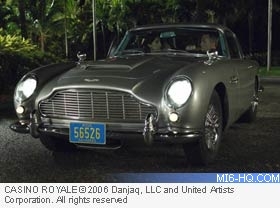 The scenes including the DB5 were cut from the final film. Casino Royale - James Bond wins a similar model and age DB5 at a poker tournament from the terrorist's middle-man, Alex Dimitrios, poaching his seductive wife Solange as well.